In November 2014, the first aluminum-body Ford F-150 truck rolled off the assembly line in an automotive manufacturing plant in Dearborn, Michigan. This upgrade makes use of lightweight, military-grade material, which presents several problems for industrial operators, service fleets and maintenance crews. Unlike previous Ford F-150 trucks that made use of a steel body panel, the aluminum-body trucks are non-magnetic. As a result, traditional mounting mechanisms that are highly favored by fleet operators, including magnetic mounting, are no longer compatible with the new trucks. Magnetic mounting features are crucial for businesses that rely on fleet leasing programs. Such options allow companies to rent commercial trucks to supplement daily operations – usually due a spike in service or product demand. In most cases, fleet leasing agreements come with strict guidelines that limit the amount of customization that can be applied on the trucks. For instance, in order to preserve one’s rental fleet, the leasing company may include a clause in the agreement that prohibits customers from repainting the truck or permanently drilling holes into the body of the unit. Moreover, short-term rental fleets are typically utilized during high-risk operations, making the trucks highly susceptible to damage. Because of this, it is common for fleet leasing agreements to include a ‘wear-and-tear’ standard for the vehicles. As a workaround, fleet operators previously used magnetic mount components on steel-body Ford F-150 trucks to secure portable equipment, such as LED spotlights, strobe lamps, sensors, communication devices, cameras and more. The non-invasive mounting option helps preserve the surface of the trucks. However, due to Ford’s decision to trade out steel for aluminum, this solution is no longer relevant. Until now. In a move to preserve one of the most essential features of portable lighting systems for service fleet operators, Larson Electronics offers a no-drill magnetic mounting solution for aluminum-body Ford F-150 trucks. This accessory is constructed of steel, which directly reinstates the magnetic feature of steel-body Ford F-150 units. Operators can mount the plate on the rear cab lights of the truck. Made in Texas, the mounting device features a weatherproof seal and can withstand crippling winds while traveling at highway speeds. 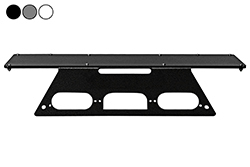 The mounting plate does not require drilling and can be installed seamlessly without damaging the body of the truck. The Larson Electronics magnetic mounting plate for service fleets is compatible with aluminum-body Ford F-150 trucks 2015 and newer. We also offer models that are compatible with a third LED brake light, as well as trucks with a reverse camera. Color options include white, grey or black.